Eat Bhuta become healthy,yes corn is the treasure of health.It is very beneficial for your health in every form even if boiled or roasted.The good thing is that while many things lose their nutritional quality after cooking,Corn nutrition is increased.Corn have many healthy properties like lutein,antioxidants,zeaxanthin,fibers,vitamins etc. 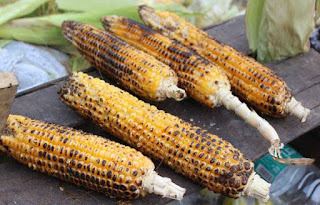 So let's know what is the benefits of eating bhutta (Corn). Fibers - Naturally loaded with lot of fibers that strengthen our digestive system. It is very beneficial in many other stomach disorders like gas,constipation. Calories - Corn have healthy calories.If you are on dieting, then this is a good option for you for gain some healthy calories. Antioxidants - There are a lot of antioxidants found in corn,which also protects us from cancer. Ferulic acid found in corn which protect against breast cancer. Control Cholesterol - Antiatherogenic,which is found in corn oil,it controls the level of cholesterol and it is also beneficial in heart disease. Reduce the chances of Alzheimer's - Properties found in corn such as thymine elements protects us from Alzheimer's. Good for anemic patient - Eating corn causes new blood in the body. Vitamins found in this, such as A, B, C, help in blood formation inside the body and Iron helps in making new blood cells. Improve vision power - Eating corn increases the eyesight, Elements found in corn such as carotenoids improve eyesight and also protect from other eye diseases. Good for pregnant mothers - In corn,there is a stock of folic acid, which is very beneficial for the pregnant ladies. Your child will grow healthy while eating corn in pregnancy. Control diabetes - Corn is also very beneficial for diabetic patients, the element found in (phenolic phytochemicals) helps control diabetes.